Juicy peaches make for a great snack simply eaten out of hand, or you can use the fruit in any number of dessert recipes, including pies and cobblers. 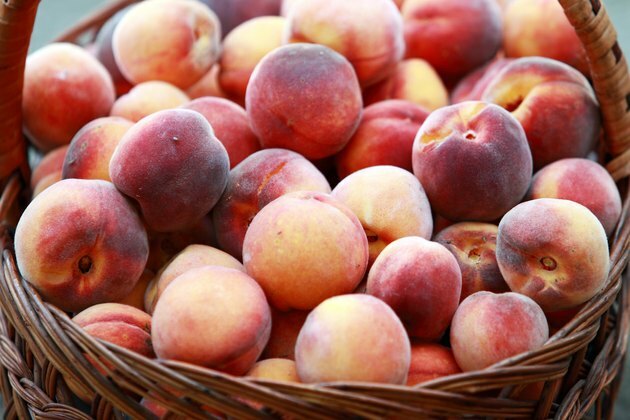 Peaches provide a good source for vitamins A and C as well as fiber, the Clemson University Extension reports. You don't have to worry about overdoing your daily calorie allotment when you grab a peach either: a 2 1/2-inch fruit contains just 35 calories. Always wash peaches before eating or using them because pesticides, dirt and other residues likely still cover the skin. Remove any stems and leaves still present on the peaches. Brush away any visible dirt or residue by hand. Fill a bowl or partially fill your kitchen sink with water, adding a small amount of soap as it fills. Place the peaches in the bowl or sink, rubbing the surface of the fruit to remove dirt and residue. Rinse the peaches in cool running water. Dry the peaches gently with a clean kitchen towel or paper towels or lay them on a clean towel to air dry. Don't use a vegetable scrub brush to wash peaches. The delicate fruit can bruise or skin can peel off because of the abrasiveness of the brush. Because many of the nutrients in peaches and other stone fruits are in the skin, consuming the fruit with the peel adds to its nutritional value. When buying peaches, look for fruits with a strong, peachy smell that give slightly when squeezed between your fingers. Selection peaches with a golden yellow background color, and remember that the a reddish color does not necessarily indicate ripeness, the Clemson University Extension reports.